Looking for ways to support students who have been exposed to trauma? Check out the new book, Building Trauma-Sensitive Schools: Your Guide to Creating Safe, Supportive Learning Environments for All Students, and discover how to build a safe, supportive school environment that helps all students learn and thrive. Traumatized students are in every single classroom, every day—no matter the grade or subject you teach. For these youth, navigating life, even in the safety of your classroom, can be challenging. Seemingly commonplace occurrences and routines can actually become classroom trauma triggers that cause a domino effect of negative reactions. And once triggered, a traumatized student can’t be engaged in your lesson, and their learning stops. Adapted from the book Building Trauma-Sensitive Schools: Your Guide to Creating Safe, Supportive Learning Environments for All Students, here are seven surprising ways your classroom environment might be affecting traumatized students. Plus, you’ll learn what you can do to minimize classroom trauma triggers and keep your students learning. Many students are comforted by low lights, sound machines, and cozy, snuggly sleeping pads. A survivor of abuse, however, can be overcome by fear in this environment. A child who has been sexually abused, for example, may have a big stress reaction that goes with the fight, flight, or freeze response. This happens not because a student is choosing to act out, but rather, is feeling overwhelmed. If a student resists naptime or gets worked up when the lights go off during a calming activity, consider why. If possible, talk with their caregivers, and work together to make reasonable accommodations. Let the child take a quiet break in a well-lit room where they aren’t required to lie down. Alternative activities might include coloring, drawing, reading, or listening to audiobooks in a comfy chair. Safety lessons and drills are meant to prepare students for unexpected emergencies. Similarly, field trips to hospitals and police stations are supposed to be educational—and also fun. But for trauma survivors, these experiences might provide a front-row seat to reliving their scariest memories. How might a student who escaped a house fire react to the sound of a smoke alarm during a fire-safety lesson? Consider a student’s potential response to a dangerous intruder drill if they’ve experienced gun violence or police raids in their home. In what way could a field trip to a hospital affect a child whose parent has a terminal illness? Or how might it impact a student who has been to that setting following injuries related to violence or assault? If an emergency drill is coming up, talk to your students ahead of time and let them ask questions to prepare. Make yourself available to talk to students and their primary caregivers about concerns. Allow youth and adults to opt out of lessons or drills when needed, and be ready to offer alternative activities in lieu of field trips that could be triggering. Have you ever asked your students to bring in a baby picture? What about constructing family trees or writing personal essays about their origin? Despite our best intentions, these assignments may be classroom trauma triggers for some students, especially those who were adopted or have been in foster care. Even “innocent” family and consumer science assignments, like carrying around a bag of sugar dressed as a baby in conjunction with discussions about how students may have poorly cared for those “babies” can remind some students of past neglect or abuse. Take an extra step and consider the unique histories of your students. Proceed as though one or more of them have experienced trauma because we know that at least one in four students has. Recognize that some students do not have access to baby pictures or information about their biological origins. Whether or not you know about their histories, reconsider these assignments. Always let students know they can come to you if something in class is making things harder for them, no matter what it is. Some of the greatest literature deals with traumatic themes. The Newbery Honor book The Great Gilly Hopkins, for example, deals with parental abandonment. Even the high school classic To Kill a Mockingbird includes mentions of child abuse and sexual assault. Before assigning books or even reading aloud a picture book, consider how it may impact your students. Talk with caregivers and school counselors to ensure students receive the relational and educational supports they need. For some students, this may be in the form of accommodations or modifications written in their 504 plans or IEPs. Include students in these decisions as much as possible. Some students may need alternate assignments, but others may be able to read a particular book outside of class. Others may prefer to read class materials just like everyone else because they are ready for supportive class discussions focused on topics that have impacted them personally. Traumatized students experience more dysregulated arousal than others. This means they feel too much or not enough more often than kids who haven’t experienced too much stress in their lives and may easily become overwhelmed. Think about your school. What areas might be overstimulating and push traumatized students beyond their ability to cope? Cafeterias are loud and full of echoes. Pep rallies rumble with noise. Classroom and hallway walls display bright, energizing artwork. Know that less is better. Simplify school spaces by having less stuff, which can be overwhelming. Think about how to create a calming area in your classroom that includes fidgets, comfy furniture, and reminders about healthy coping skills. Teach for regulation with all kids and offer brain breaks. Encourage students to self-advocate by asking for breaks when they need it too. This helps build the lifelong skill of discernment, which keeps them in charge. As a teacher, help change this cycle by connecting with your students in positive ways. Be aware. Be present. Respond sensitively. Talk with kids about times when they feel fearful or ashamed. Help them understand the difference between making a mistake and being a “bad kid.” Saying something like, “Is this one of those times when you’re feeling like a bad kid? That must be hard. I’m here for you,” often works better than challenging students to see themselves differently, especially early on. When we join kids where they are without asking them to change their perceptions, students have an opportunity to experience our unconditional acceptance and feel supported. Repeated instances like this help students experience themselves as worthy. From there, encourage students and adults to do something to make things better after mistakes are made because that builds healthy relationships and self-confidence too. We all possess the “teacher voice.” We know the effectiveness of crossed arms, stern brows, and angry frowns in some situations. 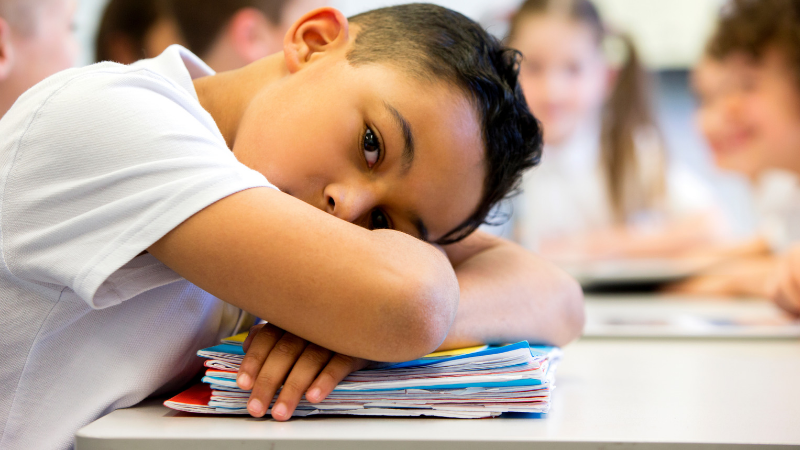 While this tone and body language might be helpful in quieting a rowdy classroom with some kids, it can also mimic the rejection, intimidation, and fear associated with a traumatic environment. Yelling, and even speaking in an overly stern voice, can trigger trauma responses in students whether educators know about their trauma or not. This is true not only when it’s directed at them but also when a teacher reprimands someone else. This can lead to increased dysregulation and worsening behavior, which prevent learning. In a trauma-sensitive school, staff understands that we will not help kids by trying to scare them into doing things. Instead, educators know that feeling safe is what contributes to positive change. Connect with students, help them regulate, and then teach. Be positive with students and set limits with empathy. Instead of thinking, “How can I manage this kid’s behavior?” Think, “How can I connect with this student and help them get regulated?” Soon you will find yourself relying less on your “teacher voice” and more on good old-fashioned trust and respect.